Vlaďka Mušálková (born Votavová) is Director of AMO. She is responsible for fulfillment of strategic priorities, fundraising and financial management of AMO. 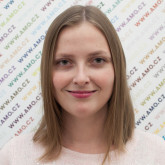 She also oversees projects and their reporting and communicates with partners in the Czech Republic and abroad. She graduated from the Institute of International Studies and the Institute of Political Studies of the Faculty of Social Sciences, Charles University in Prague. She studied in the United Kingdom (2009-2010) and Russia (2012), too. Besides working at a non-profit, she gained experience in private sector at Cummins Inc. and Zatisi Catering Group. She has cooperated with the AMO since 2007, she was appointed its Director in February 2014. In 2014-2018, she was a member of the board of DEMAS – Association for Democracy Assistance and Human Rights. At the moment she is a member of the program board of the international symposium “Czech Foreign Policy” of the Institute of International Relations, a member of the coordinating council of the National Convention on the EU, and a member of the Prague hub of Global Shapers, an initiative of the World Economic Forum. She participated in several international exchange programs such as Promoting Tolerance and the International Visitor Leadership Program (IVLP) focusing on women in the political and social sectors. She specialises in the development in Central and Eastern Europe with focus on politics and civil society.